0.10mm diameter End Mill with ring , used to mill large paths in the FR4 board material. 0.15mm diameter End Mill with ring, used to mill large paths in the FR4 board material. 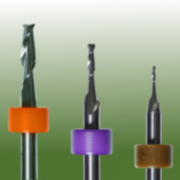 0.30mm diameter End Mill with ring, used to mill large paths in the FR4 board material. 0.254mm diameter End Mill with ring , used to mill large paths in the FR4 board material. 0.40mm diameter End Mill with ring, used to mill large paths in the FR4 board material. 0.50mm diameter End Mill with ring, used to mill large paths in the FR4 board material. 0.80mm diameter End Mill with ring, used to mill large paths in the FR4 board material. 1.00mm diameter End Mill with ring, used to mill large paths in the FR4 board material. 1.50mm diameter End Mill with ring, used to mill large paths in the FR4 board material. 2.00mm diameter End Mill with ring, used to mill large paths in the FR4 board material. 3.00mm diameter End Mill with ring, used to mill large paths in the FR4 board material.